Friends of St. Louis Cemetery consists of a group of parishioners dedicated to restoring, revitalizing, and maintaining St. Louis Cemetery. St. Louis Cemetery is the Diocese of St. Petersburg’s oldest Catholic cemetery, founded in 1874, as the final resting place for parishioners of the area’s first church, St. Louis (now Sacred Heart). 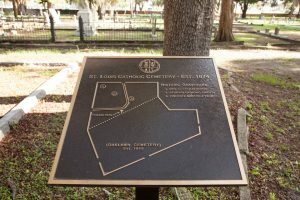 Located just a half mile away from Sacred Heart, St. Louis occupies the north section of Oaklawn Cemetery and includes some of Tampa’s most prominent settler families as well as the first five priests who served the parish – three of whom died in the yellow fever epidemic of 1887-1888. Over the years, the gravesites and grounds have gone through their share of vandalism, neglect, and the passage of time. Friends of St. Louis Cemetery was formed to assist in returning the beauty and dignity to these sacred grounds as well as preserve them for future generations. Members of Friends of St. Louis take on various projects throughout the year, from cleaning and maintaining the current landscape as well as restoring and conserving onsite buildings and gravestones. There are no regularly scheduled meetings for Friends of St. Louis. Members are alerted to special service projects via email as well as in the bulletin.